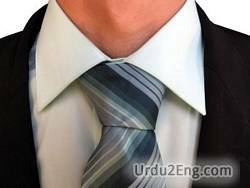 Neckwear consisting of a long narrow piece of material worn (mostly by men) under a collar and tied in knot at the front. 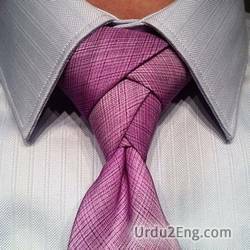 He stood in front of the mirror tightening his necktie. The minister married us on Saturday. A social or business relationship. The teams drew a tie. I am tied to UNIX. Connect, fasten, or put together two or more pieces. Can you connect the two loudspeakers? A fastener that serves to join or connect. Form a knot or bow in. The finish of a contest in which the score is tied and the winner is undecided. Create social or emotional ties. The grandparents want to bond with the child. A cord (or string or ribbon or wire etc.) with which something is tied. He needed a tie for the packages.